There's not a lot of lots for sale in Tallahassee according to most homebuilders, and this should mean that lot and land prices should rise as demand returns to the Tallahassee real estate market. I was asked by a fellow Realtor to provide an update on lot and land sales, and today's post provides a positive view of where we are seeing homesite sales heading. First of all, thanks for the kind words Ben. Secondly, you are not alone in wondering about developed lots for sale in Tallahassee. Both unit sales and average prices are finally rising for lot sales. In the real estate graph below, we see a plot of two important trends. 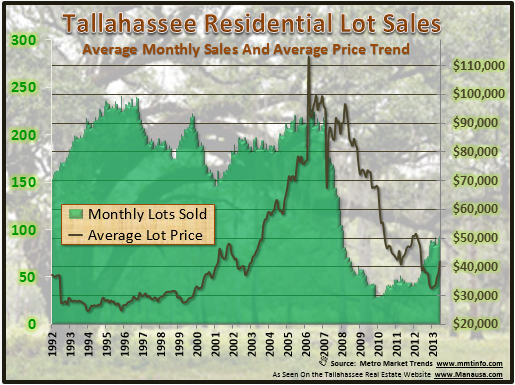 The green lines show the one-year trend for monthly lot sales in Tallahassee, while the brown line shows the trend of average lot prices. Currently, we have seen the average sales price for lots rise to just under $42,000, but more importantly unit sales have tripled from a Tallahassee real estate market low recorded in 2009. Right now, the one-year trend for lot sales is at 93 per month, roughly 1/2 of the number that was "average" in Leon County for all of the 1990s. This means that demand is still far below normal, even though it has finally returned to the market with some consistency. If you have been holding onto a buildable lot and want to know what to do, I would recommend that you run a cost benefit analysis of holding on to the lot versus selling it today. Whether you owe money on it or not, there is a lost opportunity cost should you decide to hold (the rate of return that you would receive if you converted your lot into a new investment today). If you would like to know more about lot sales in Tallahassee and what you should do, just drop me a note and we can schedule a time to review your particular situation and needs.